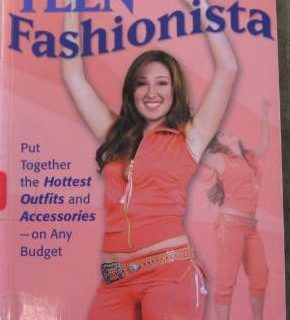 Submitter: This book was recently weeded from the adult non-fiction section of a public library. The inept drawings alone make it awful enough for inclusion (there isn’t a single photo), but the real hilarity is in the stories the author concocted around these fictional Londoners. Tim, for example, is feeling rather dejected as he shows us what the fashionable unemployed man was wearing circa 1975, while Nicola offers evidence that miniskirts in 1965 actually ended just above the knee. 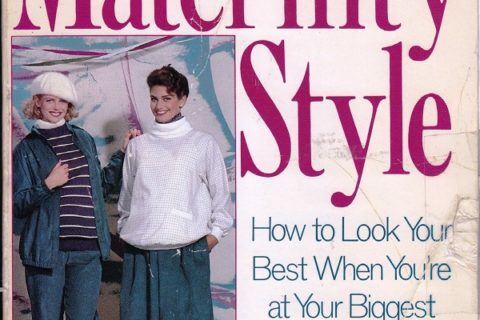 Her boyfriend, Robert, (whose hair is “quite long”) models the frills, florals, and bright, startling colors of the “peacock revolution” with his, um…plain white suit and plain white shirt. But his tie is patterned. That’s startling, right? My favorite, though, has to be the nameless 1976 punk on p. 51. 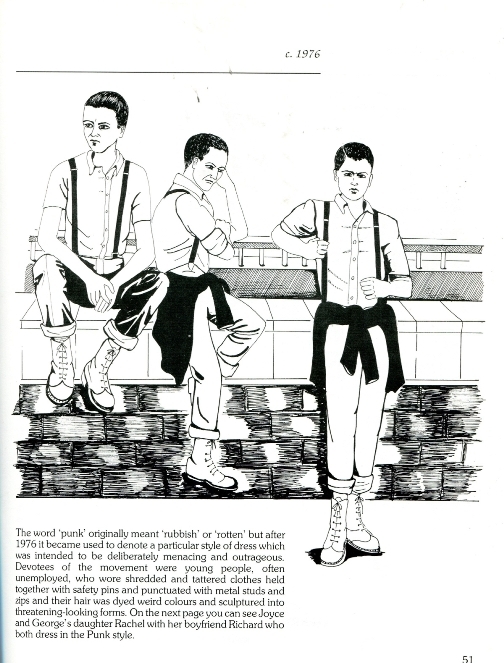 The author has lavished special care on this illustration, showing the same angry young tough (I think) in three different poses: waiting for a bus, thinking really hard, and pretending to milk a cow. Check his “outrageous” buttoned business shirt with the top button undone! The “menacing” cardigan tied around his waist! And the “threatening-looking form” of his hair, which is dyed a “weird” black and is approximately the exact shape of his head! I’m strongly tempted to make copies of these and put them out as coloring pages. Holly: Now that’s a great use for this book! oh my! I just discovered we have this book (and others in the series) in our Juvenile collection. May have to do some weeding. The author should probably have done more homework on the etymology of the word “punk,” as well. Then again, perhaps she did, and felt that her audience would be better off just not knowing. Goodness, that’s a blast from the past; I remember this book (and others in the series) from when I was a kid. Although the drawings are pretty terrible, the nice thing about them was that they did try to show how different kinds of people dressed with their odd storylines, so they showed you working people and old people as well as young, affluent fashionable people. 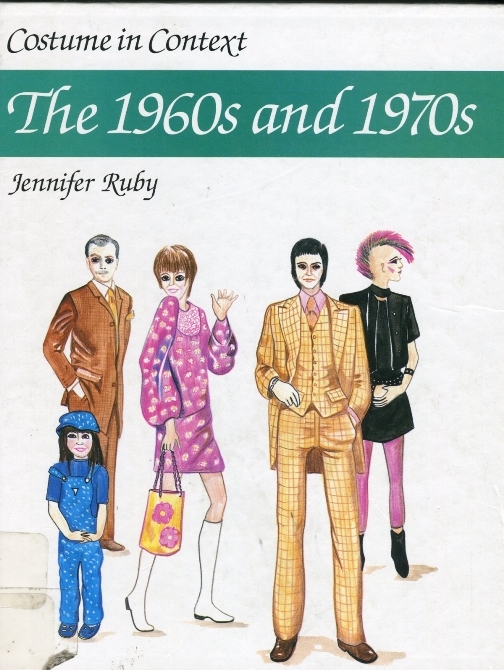 Cripes, you could get better reference material for 60’s & 70’s costumes via some of the other books you’ve shown us. That’s the longest mini-skirt I’ve ever seen. The artist has done a stunning job of accidentally making the Peacock Revolution guy look like Paul McCartney… unless it was intentional, in which case she’s done a stunning job of introducing a poorly-drawn Beatle into her poorly-drawn book. 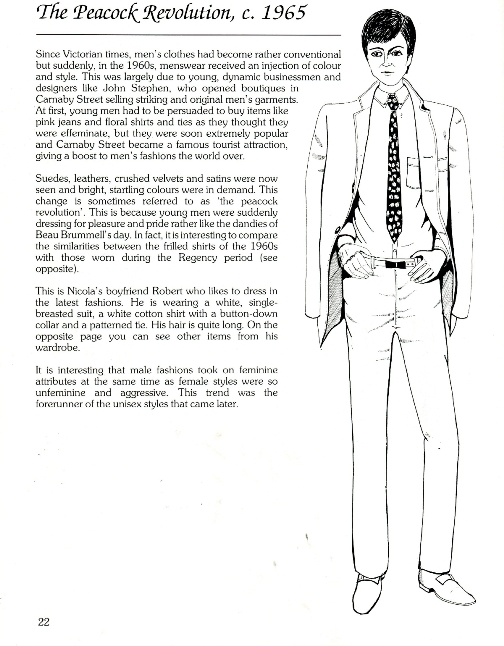 Nice to know that although I am employed, my style of dressing is “Unemployed Man, c. 1974.” I always thought my Look should have a title! I became a teenager in 1968, and the only thing in these drawings that looks authentic to me are the shoes. Wearing “boy” shoes was the only way in which I was fashion-forward. 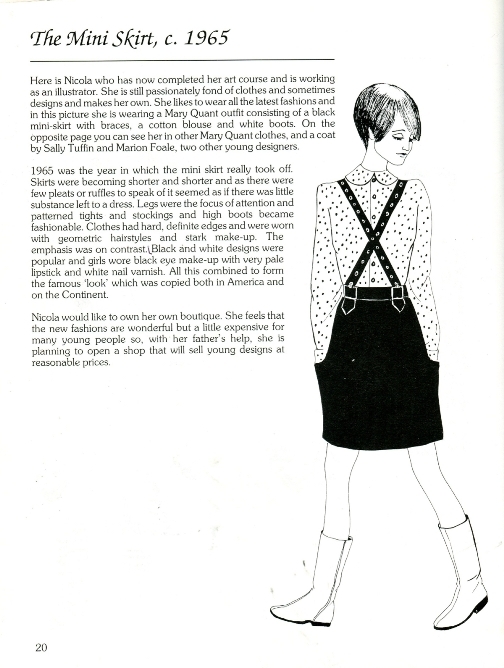 The girl with the not-short mini is wearing “mod” boots, in which she probably dances the Pony. I’m confused. The Peacock Revolution was supposed to infuse color into men’s wardrobes. The picture is black and…well just a pencil drawing. The “boyfriend” is wearing a bright and colorful…. no wait. He is wearing a white suit and a white shirt according the the description (what do British peacocks look like I wonder?). And his hair, also according to the description, is supposed to be long. It isn’t. My guess is that someone in production lost the pictures the night before a morning deadline and had his 8 year old daughter draw these pictures on the fly. That’s rich. The small city in which I went to college during the 90s had this series and it was one of my favorites at that library… I read the entire series like it was somebody’s novel (which it does portray itself as in a way) and had good times with it. 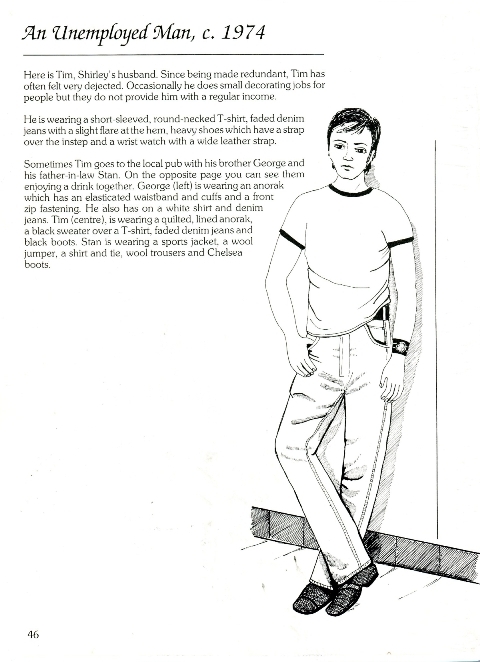 I also learned how to dress like a Mod (my personal style) from the series. I have often considered weeding such costume books (including that very one) from various library collections I’ve looked after down the years. Usually showed mercy on them because, though not brilliant, illustrations and commentary like Ms Ruby’s does give the reader (often a child) the general idea. Have you noticed that if people come in looking for the 1960s volume you can always find the ’50s and the ’70s, but NEVER the one they want? Anyway, you can’t get enough historical costume books. Maybe don’t keep the bad ones up front, but keep them round the back, in Reserve Stock, or whatever. Chuck it out and guaranteed, someone will come in wanting that book a few hours later.